Hey “I Do Not Despair” made it into national Italian news about cycling. Sadly I think my two appearances on stage at Italian bike shows were not the cause for the use of the quote that headlines my blog. But it was good news all the same. 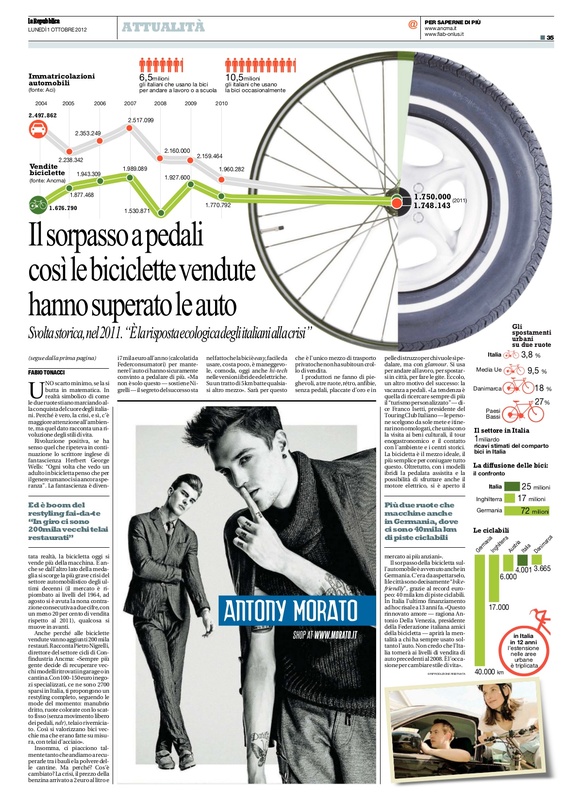 National newspaper La Repubblica reported yesterday that in recently published figures 2011 bike sales beat car sales for the first time since the second world war. 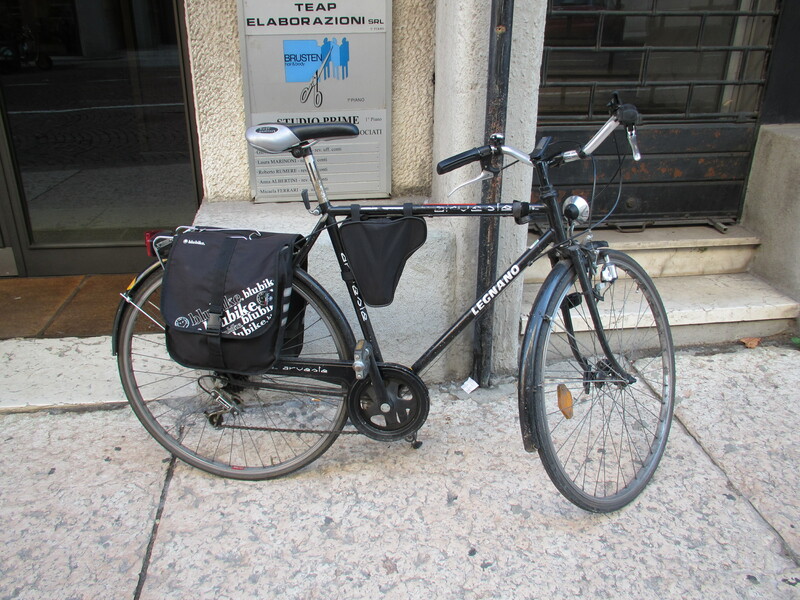 “Le biciclette sorpassano le automobili”. Print version below, with good graphic. Although Google Translate doesn’t offer the word “despair” anywhere I was really pleased to see the quote in use, it felt so topical after my recent trips to Italy. I hope the Italians are able to use this momentum too, The President of my hosts FIAB is quoted saying “I do not think that Italy will return to the levels of car sales prior to 2008. It is an opportunity to change lifestyle” Because this is almost old news in northern Europe, even less confident British cyclists bought about a million more bikes than cars last year. 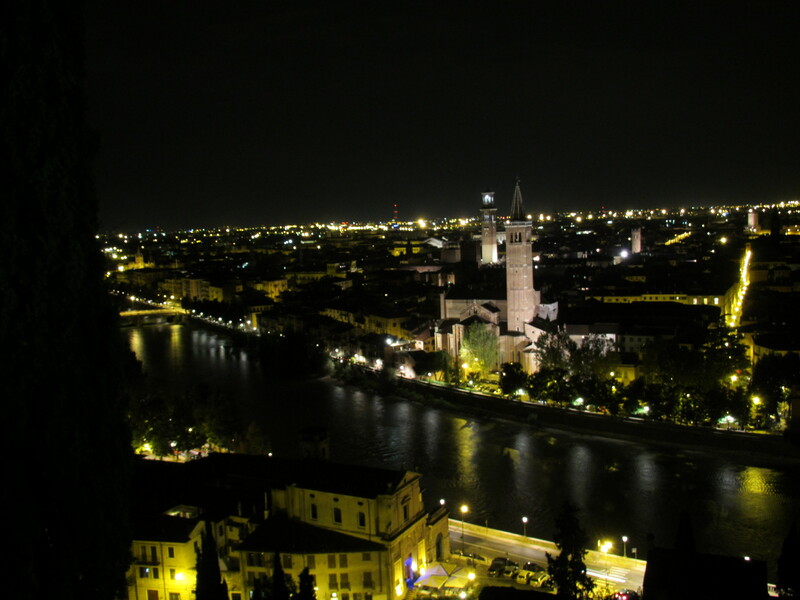 Lots more work to do in Italy! 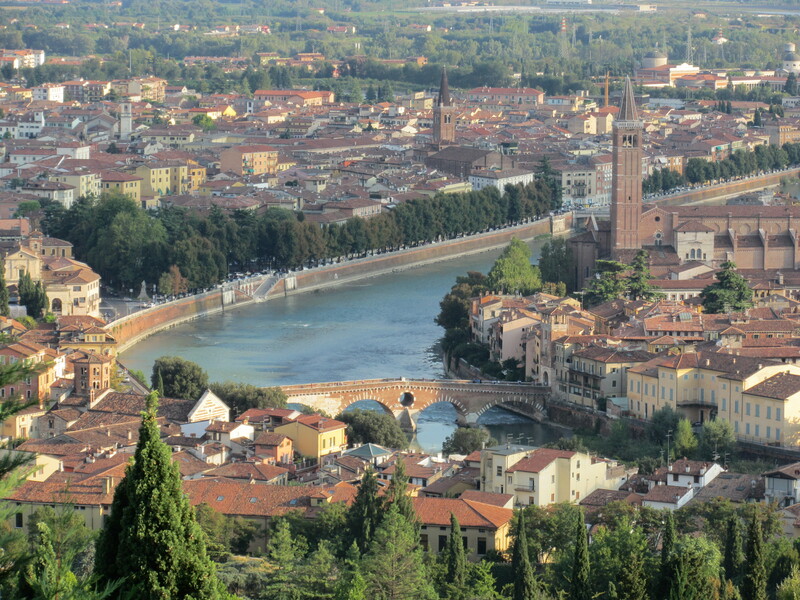 I have been pretty rude about the politics of transport in Verona in my previous post, especially when compared to Padua which has taken a completely different path. 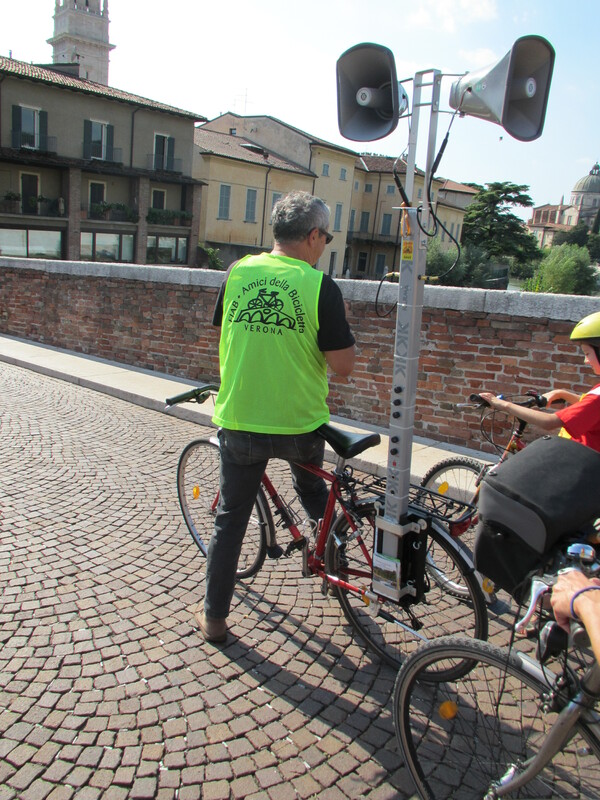 However in typical contrary style the negative conditions for cycling have resulted in a strong cyclists’ movement with the Verona branch of Federation Italiana Amici della Bici (FIAB) having its largest branch in the city, over 2000 members. I was there to work at the EICA trade fair and to have meetings with some of the national leadership of FIAB but the local members were such excellent hosts I have to give them a write up, especially as they gave me a great insight into their city, warts and all. First up was Giorgio, president of the branch who turned up at my hotel first thing on Saturday to provide me with a bike for the weekend and set me off to the show. As I have written many times, it’s not about the bike and the fact that he gave me his careworn town bike with its rattles and pannier meant that I wasn’t too worried about where it got locked up or how I rode it. In the afternoon I was invited down to the city centre to meet the local branch who were launching the first weekend of European Mobility Week by holding a series of guided rides. No prospect of a Car Free Day here so this was an exercise in grabbing the city’s attention. I could soon see why this group was well established in the city. The agenda for the day was to invite different professional groups to come for a guided ride at a set time in the day, either professions that were supportive of the group or some groups of friends. Simple, but so effective because it encourages existing networks to encourage their friends and contacts to come along. The ride itself was a tourist tour but it was also to boldly go through the streets in bunch and be proud to be cyclists whether it was on the one or two pedestrianized streets or out into the busier roads. That was made clear by the bibs with slogans we were asked to wear, and because Paulo our guide had a PA rigged up to his bike. I assumed this was because he was going to give us a tour. Oh no, he was using the PA to shout to the crowds, not just us. My Italian is non-existent but it doesn’t take much to hear the word “bici” repeated with great enthusiasm and to get warm smiles from the pedestrians to see that the man is a natural entertainer. A nice ride, repeating some of the areas I had walked the previous day, but great fun from the saddle and with company. Oh and here’s a thing (not one for my wife). I had to ask why the group of teachers were all women? 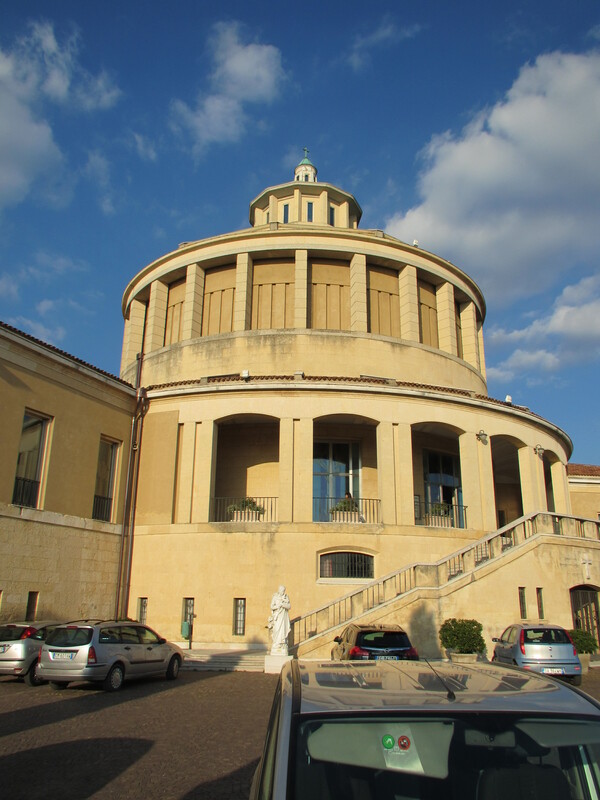 I was astonished to be told that all teachers in Italy are women. I checked that this didn’t just mean primary schools like many countries but I assured that almost all teachers in Italy are female without really being able to understand why. 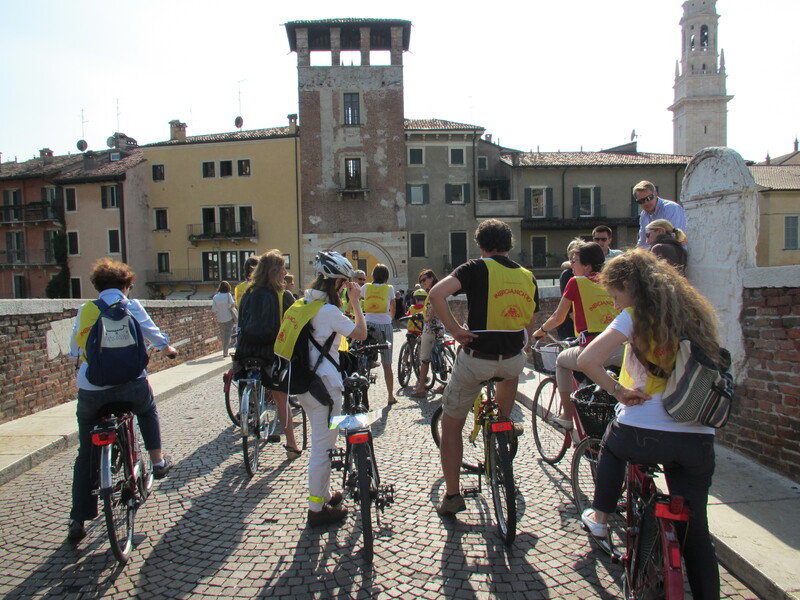 The professional groups idea was certainly a success, a group of up to 20 every half an hour meant that there was a steady flow of people through the day learning about cycling in Verona. There were also quite a lot of cyclists around in the town and I was just generally snapping a few as a backdrop to for a blog post. I was just snapping this chap when I realised a group of sports cyclists were passing by in the background – none other than the bike show test ride coming back from their spin with Mario Cipollini who as if to order had popped into the corner of the frame. 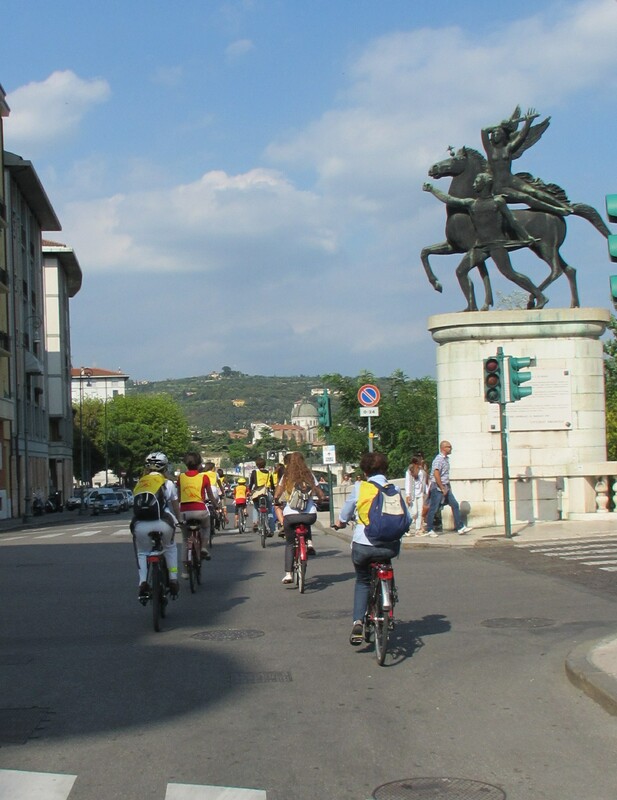 The test circuit let show visitors take a huge range of road, electric and mountain bikes out for a spin of up to 15km around Verona returning through the main square. Who’s this just passing by on his bike? 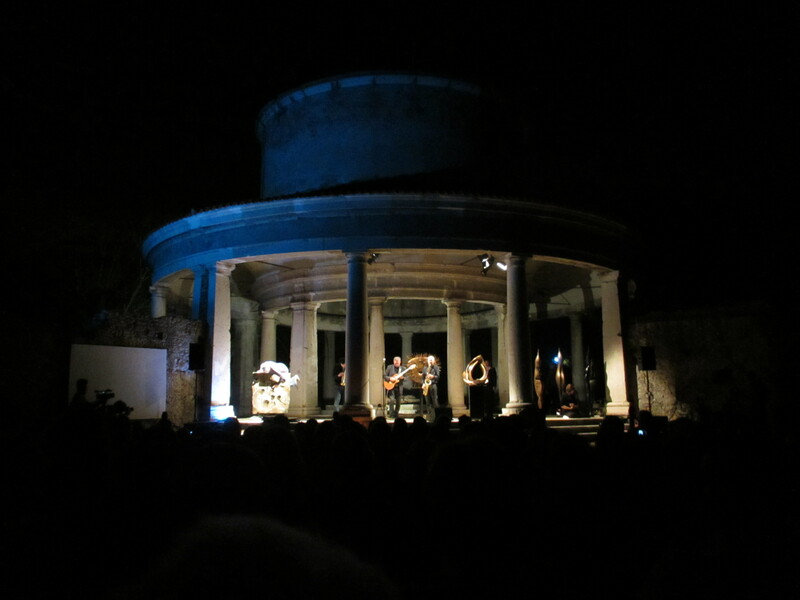 As well as the group rides I was also told I had been invited out to a concert in the evening by one of our local hosts. “Concert” I ask, “what sort of concert?” Nobody actually knew, other than it was going to be at a building called Lazzaretto outside the city. From what I could briefly glean on my smart phone I thought it was some sort of restored stately home. About the music, no idea. 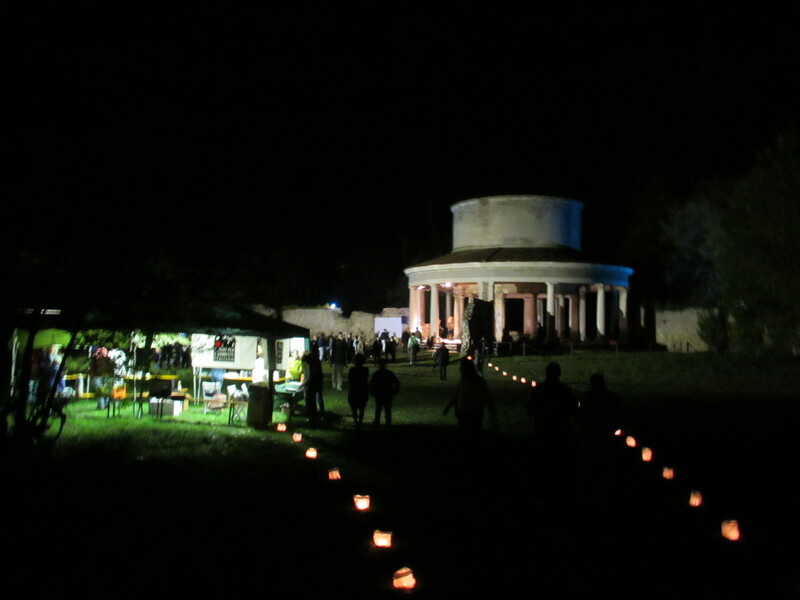 So that’s how I ended up at a sort of modern jazz outdoor concert for the Italian National Trust to promote the fact that they had acquired the grounds and ruin of a former isolation hospital and military base that had been partly blown up by anarchists. “Concerto in Bronze” had a celebrated percussionist beating out music on the bronze statues of Gino Bogoni while a dancer and narrator telling the story of the sculptor’s life. I had the introductory speech by the National Trust translated so I learned a bit about the rotunda that had been at the heart of the old hospital. But I didn’t understand a word of the narration and I have to admit that a grown man lying on a bronze statue shaped like a melted bar of chocolate hitting it with his fists stretches my definition of music. But how can I top sitting in open parkland with a slight chill in the air surrounded by people who really cared about the place we were in and the city they live in, listening to tawny owls hooting in the trees around us. Magical. And on the way home I was treated to a trip up to the terraces of an old castle which sat above the Roman theatre I had been on earlier in the day. Fantastic views of the city from above. On Sunday the lure of the test ride circuit and the views from the castle drew me and I couldn’t wait to get out in the early evening and do a proper tourist ride. Even better I was told that the circuit was actually part of the world road race circuit used twice in the past. 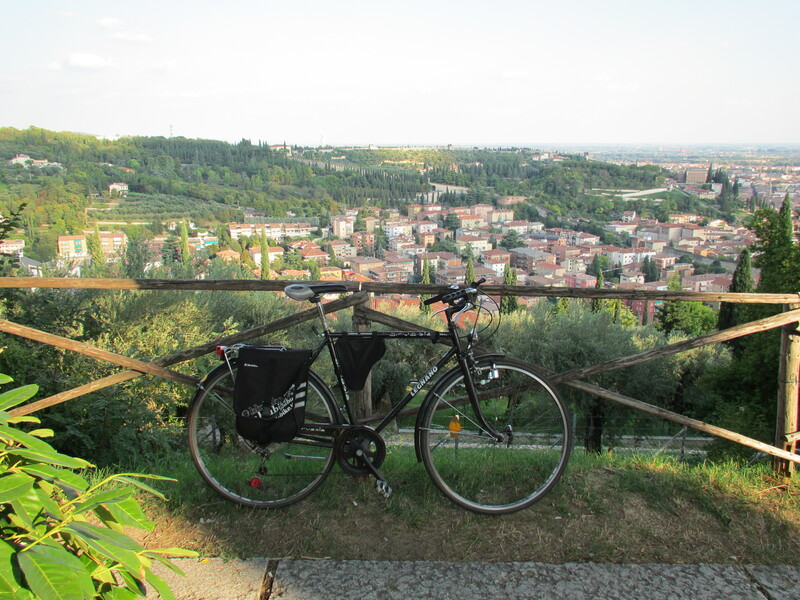 I was soon zigzagging up the hairpins on a good climb out of the city, bit of a challenge on the single chainwheel of Giorgio’s bike but certainly rideable. Before long I was up to a good height and able to look over to the valley beyond as well as great views back over the city itself. On one side the old city with its mediaeval roofs and Roman origins, but it was easy to see on the other valley why this is also a strong industrial area too. 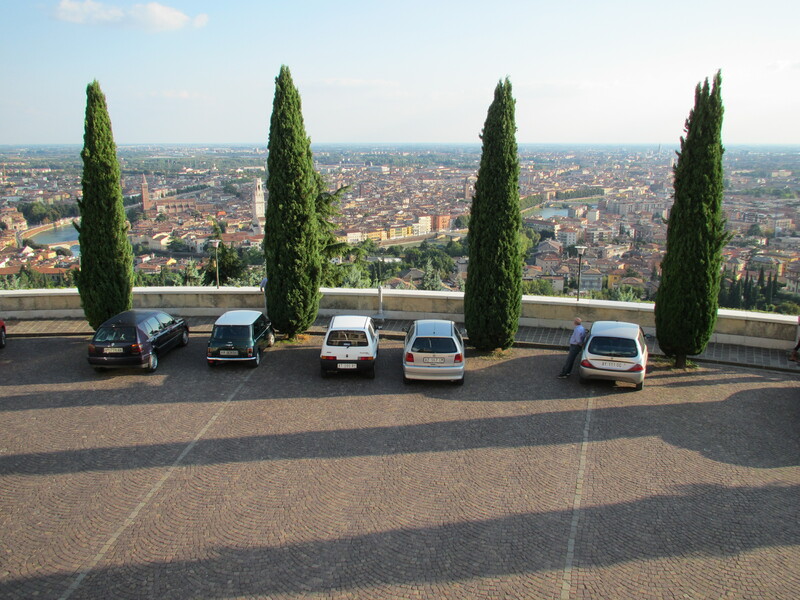 The road itself kept the higher ground and looped round above the city until I came down to the Santuario Madonna Di Lourdes, a domed church set high above the city and one of the most distinctive sights on the city horizon. 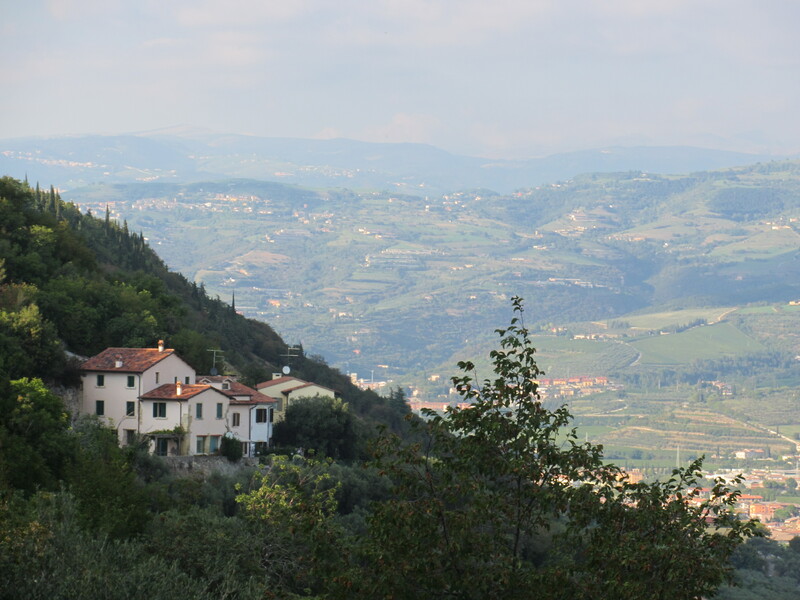 It was a stunning spot and I got some great views from its terraces, including a nice view back across to the previous climb. But even here I could not resist a mental rant that they just could not keep cars out of what should have been an oasis of silence. 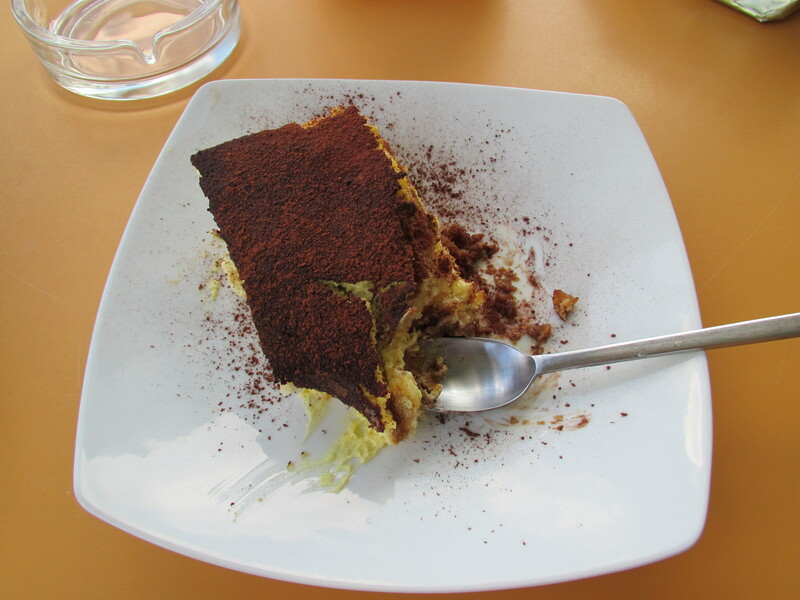 However the café behind the Stantuario did offer a very tasty espresso and tiramisu, a classy step up on the coffee and cake at home. Then a great descent into town at 50kmph before rolling back through the old streets. In fact, I enjoyed it so much I went back again in the early morning for an final spin, a bit cloudier than the previous day but still a lovely ride. 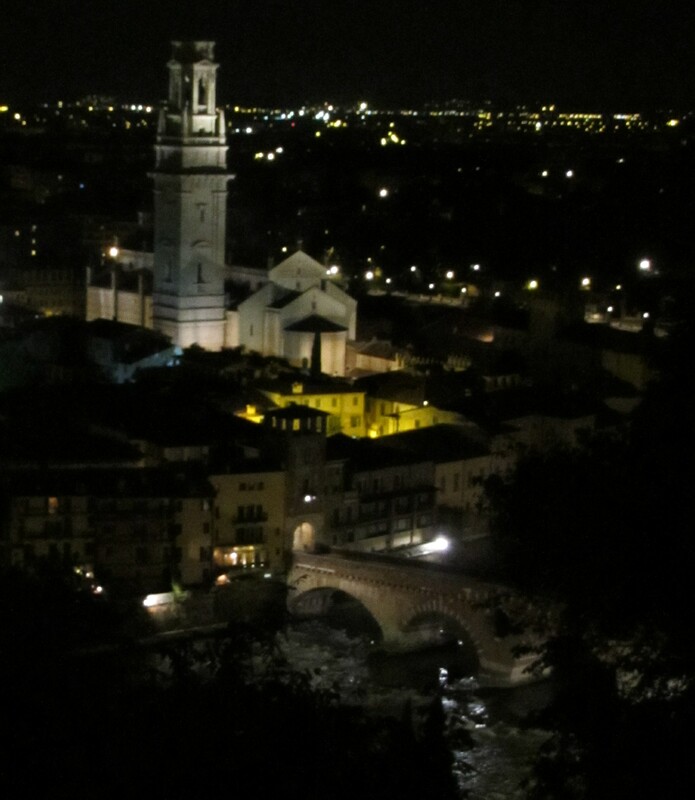 Thanks to all the FIAB members in Verona, your hospitality made it a very special visit. I wish you every success in your frustrating battle to create a cycle friendly city.